Paving stone is one of the popular granite welcomed due to its good outlook and reliability,for fast and easy installation. 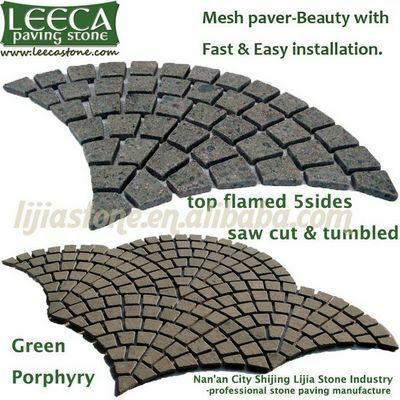 Driveway stone mat,stone on mesh,outdoor pavers are the popular materials especially for fast and easy installation which are welcomed due to its good outlook and reliability . Main color: White,Light Grey,Dark Grey,Black,Yellow,Red,Green etc. LEECASTONE is specializing in paving stone,cobblestone,mesh stone,cubic stone,natural stone,wall stone since 1993. Own fatctory,own design and R&D department.Own marketing team. Competitive are the quality & price of our excellent products. Paving stone,Landscaping stone,Environmental Stone,Natural stone,Cultural stone,Antique stone,Outdoor stone. Square,City Plaza,Garden,Patio,Courtyard,Deck,Path,Driveway Wall etc construction stone. Material & Color: Granite,Porphyry,Marble etc. According to customers drawing or photos or as usual or by our design and R&D department. Finish: Tumbled,Flamed, Natural split face,Saw edges etc. Packing: Outside pacing: In fumigated strong wooden crate,inner packing by foamed plastics. Add:Xidong Industrial Zone, Shijing Town, Nan'an Fujian China.